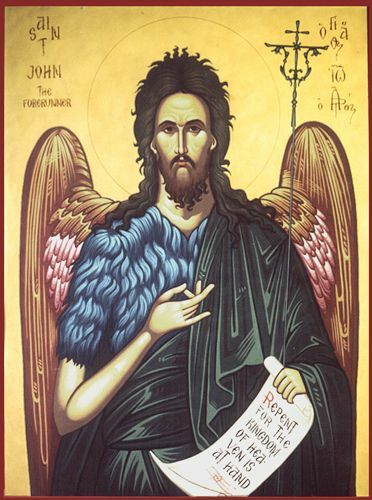 Almighty God, You gave Your servant John the Baptist to be the forerunner of Your Son, Jesus Christ, in both his preaching of repentance and his innocent death. Grant that we, who have died and risen with Christ in Holy Baptism, may daily repent of our sins, patiently suffer for the sake of the truth, and fearlessly bear witness to His victory over death; through the same Jesus Christ, our Lord, who lives and reigns with You and the Holy Spirit, one God, now and forever. Amen. In contrast to the Nativity of St. John the Baptist (observed on June 24), this festival commemorates his beheading by the tetrarch, Herod Antipas. From the perspective of the world, it was an ignominious end to John the Baptist’s life. Yet it was in fact a noble participation in the cross of Christ, which was John’s greatest glory of all. Christ Himself said that there had arisen none greater than John the Baptist. He was the last of the Old Testament prophets and also the herald of the New Testament. As the forerunner of Christ, John fulfilled the prophecy that the great prophet Elijah would return before the great and terrible day of the Lord. By his preaching and Baptism of repentance, John turned “the hearts of the fathers to their children and the hearts of children to their fathers.” And in the footsteps of the prophets who had gone before him—in anticipation of the Christ whose way he prepared—this servant of the Lord manifested the cross by the witness of his death. (From theTreasury of Daily Prayer, p. 670. Reflection: The Tetrarch Herod Antipas hears the news of Jesus’ Name becoming well known. Herod Antipas heard theological discussion on the identity of Jesus of Nazareth. Herod came to a conclusion about John. A conclusion may reflect an intellectually settled opinion but that’s all. A confession involves one’s whole person. A person will not risk martyrdom for a conclusion but risk one’s life for a confession. A conclusion is obviously not the same as confession. Peter’s Confession comes by the revelation of the Father (St. Matthew 16:17). Herod’s confession comes from his own estranged head and heart. Herod Antipas’ conclusion is his own ‘theology’ which seems to come from his need, even to feel bad about his immorality marrying his brother’s wife. Herod Antipas’ conclusion was factually incorrect, but why would he have reached such a conclusion? Herod Antipas had John in his palace to preach. He kept John safe, we are told. Maybe Herod Antipas reached his conclusion because he could assuage himself in the guilt of his sin of killing the prophet by the lie that John was actually alive, resurrected! Very convenient! We really do not know the reason Herod kept John alive because the text does not say so Never the less, ‘Jesus-is-John- raised- from- the-dead” is blatantly a false theology. There are many versions of the Lord. Pastor Matt Richard, in his book, Will the Real Jesus Please Stand Up: 12 False Christs identified these twelve as: The Mascot; One Option among Many; The Good Teacher; The Therapist; The Giver of Bling; The National Patriot; The Social Justice Warrior; The Moral Example; The New Moses; The Mystical Friend; The Feminized Jesus; and The Teddy Bear. O Lord, You granted Your prophets strength to resist the temptations of the devil and courage to proclaim repentance. Give us pure hearts and minds to follow Your Son faithfully even into suffering and death; through the same Jesus Christ, our Lord, who lives and reigns with You and the Holy Spirit, one God, now and forever.